So most of you bikers will have heard about Speedohealer? Well in case you haven't, it's one of several useful gadgets made by Healtech Electronics. The item I fitted to my bike is Speedohealer v4, which is a true plug and play item, with the v4 denoting it's version 4 I believe. 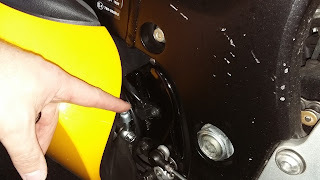 With most bikes having optimistic speedos, and with my ongoing IAM involvement, I was looking for a simple way to alleviate trundling around too slow. To give an example, my 2013 Busa in stock trim would achieve a true 100 km/h (GPS verified) with a speedo reading of 109/110. The previous bike, Suzuki GSX750F was even worse, a true 100 km/h would show 114/115 on the speedo although this was partly due to a change in rear tyre size. So for a number of years I was using a GPS speedo, which worked quite nicely. Yes I know in some ways GPS will only give you a true reading when travelling straight and level, but if you use it to give you an indication of speedo error, the guessing is removed. What does remain a downside, and here my Dutch blood shows through, speedo error directly translates to odometer error, so an optimistic speedo will also mean an optimistic odometer. Shock horror! So the odometer would reach 100,000 when in fact I may have only done a little over 90,000 in the case of my Busa?!? Can't have that sort of thing eating into the resale value of my bike huh? But serious for just a minute or two. So the Speedohealer allows me to correct both speedo and odo readings to bring them as close to true as possible, sounds like a win/win in my book. Ordered the Speedohealer from the nearest distributor I could easily find, in my case www.amcmotorcycles.com which is in Australia. 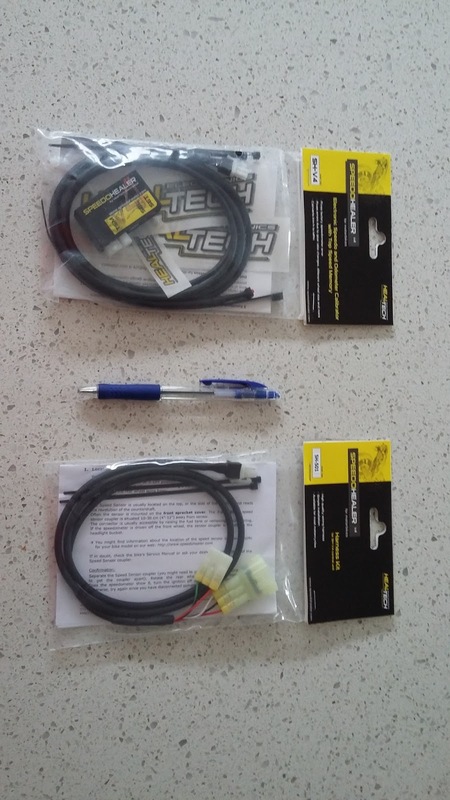 The Speedohealer v4 is a standard item, you just have to order the bike specific wiring loom to go with it. So how does it work? Well, on your front sprocket cover is a speed sensor, this sends the number of rotations your front sprocket is doing, to the speedo. The Speedohealer allows you to manipulate the signal to correct the speedo error, with the online calculator on the Healtech website making this a breeze. A speedo error is typically linear, as in if it's 4% optimistic this shows across the range, ie 50 reads as 52, and 100 reads as 104. In my case, using the GPS speedo I worked out that actual 100 showed on the speedo as 104. Different than stock trim due to a rear tyre change, stock is 50 section, now running a 55 section. Plugged these numbers into the online calculator and it gives a calibration value of -3.8% which I reduced by 1% to leave me with a true 100 being indicated as 101. My reason for this is to allow for a half worn rear tyre, and knowing a tyre will "grow" a little when hot. The fitting itself is straightforward, follow the wire from the front sprocket cover speed sensor to find the connector into the wiring loom. 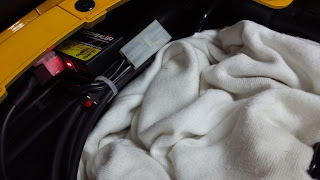 Unplug, plug in the wiring loom supplied for your bike, connect to Speedohealer, tuck the unit in an easily accessible place, such as under rear seat. Program and job is done. On a faired bike, the hardest part is removing panels to get access. No wires need to be cut on your bike, so you can easily remove the unit when you sell/trade-in and use it on your next one. Just have to get the right wiring loom to suit the next bike. Top bag is unit, bottom bag the bike specific wiring loom. Pen is to give idea of scale/size. Pointing out the location of speed sensor on front sprocket cover. Location under pillion seat, accessible for programming. Hey, thanks for the brilliant write-up and photos Rob, that's really helpful and answered some questions! I just nipped outside to look for my sensor but it's not as obvious as yours. Still, I've got time to poke around a bit whilst the healer is on order. Great stuff mate!